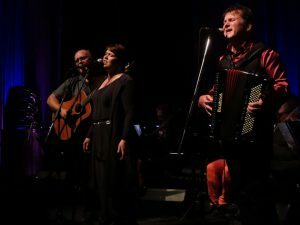 The Barra MacNeils » Celtic Colours’ encore presentation of the Unusual Suspects featured a stirring performance by Cape Breton’s Barra MacNeils. Twenty-seven master musicians played their hearts out at a special event for the Cape Breton festival’s 20th anniversary. When Celtic Colours International Festival co-founders Joella Foulds and Max MacDonald saw Scotland’s Corrina Hewat and David Milligan present the first version ofthe Unusual Suspects at Glasgow’s Celtic Connections in 2003, they realized they’d found just the thing to kick their Cape Breton event up a notch. After glorious presentations in 2004 and 2006, these Suspects have been conspicuous by their absence, but this year’s 20th anniversary celebration was the perfect excuse to line them up again with members old and new, for shows in Sydney on Saturday and Port Hawkesbury on Monday. Combined, the 27 musicians assembled on stage on the latter night played with a force to match the storm raging outside the SAERC Auditorium. Hailing from Scotland, Ireland, England, Nova Scotia and British Columbia, they tore through 53 tunes and songs, with only 12 numbers repeated from previous incarnations, some familiar to the sold-out crowd, and others surprising new discoveries. Another featured Cape Breton stars the Barra MacNeils, now celebrating their 30th anniversary, on a luminous By Northern Light, with siblings Kyle, Lucy and Stewart’s instinctive harmonies shining out in the dark auditorium.